In Year B of our Eucharistic Lectionary, the semi continuous reading of the Gospel of Mark is interrupted by a sequence of five excerpts from the sixth chapter of John on the Bread of Life. This happens once every three years and when it does, people in the pews ask why we spend so many Sundays hearing about Jesus Christ as the Bread of Life. It’s a great question and I hope my attempt at an answer will be almost as great, or at least helpful. Each one of the three synoptic gospels – Matthew, Mark, and Luke – has its own year in the three-year Revised Common Lectionary. John is sprinkled around during Lent, Christmas, and a couple of other times. Because of this, there is no really suitable niche for the important teaching on the Bread of Life. Since our lectionary is a Eucharistic lectionary, it would be inconceivable for those who developed the lectionary to omit this important discourse in the three-year cycle. They decided to interrupt the semi continuous reading of the Gospel of Mark at the point when Mark is about to recount the story of the feeding of the multitude in order to give us John’s more elaborate account. We are a Eucharist-centered Church and we need the instruction provided by the Bread of Life Discourse of John’s Gospel in our Eucharistic lectionary. It is so important and so powerful that we devote five Sundays in a row to explore the depth of its message. This Sunday, we will read the account of Jesus’ feeding of the multitude at the beginning of the sixth chapter. As we continue to read from this chapter for the next four Sundays, we will examine John’s indirect account of the Eucharist. Bear in mind that in John’s report of the Last Supper there is no mention of the bread and wine. Jesus is inviting everyone to eat this living bread. The bread our Hebrew ancestors in the faith ate in the wilderness sustained them in their journey. The Living Bread, Jesus Christ, is food that sustains the cosmos - not just our tribe, or race, or nation, but the cosmos! That means that if we feast at the table with The Bread of Life, we are not the only invitees. There are others, many of whom are not like us, some of whom we don’t like, and plenty with whom we will disagree. My response was to suggest that there will be times when we come to the Altar to dine with Jesus, the Bread of Life, and notice someone we can’t abide kneeling beside us or across from us. “When that happens,” I said, “remember this moment and remember that the same divine Love that welcomes you to this feast welcomes others who need it just as much.” After all, as someone has said, the bread that Jesus gives for the life of the universe (John 6:51) is multigrain. John 6:51 says that those who eat of this bread will “live forever.” That is the consistent translation in almost all the versions of the Bible. However, some scholars point out that the literal translation of the Greek text says we will “live into the age.” The “age” – eternal life, abundant life, kingdom of God, kingdom of heaven - is a state of being where we live with God who is both in and beyond time and space. When we feast upon the Bread of Life, we are living into this divine cosmic reality. It nourishes us for the ways we touch and change that reality. So, in this banquet, we all become one body not because we all agree or because we all are alike. We become one body because we share in one bread – the Living Bread, Jesus, who is present for us in a wonderful and mysterious way in this banquet that is happening in the here and now and at the same moment in the age into which we are living, with faith, hope, and love. This Bread of Life is our true sustenance. As we are fed, so we are sent to feed others. It really is going to be good to spend a month of Sundays on this topic! I'll see you in Church! Here is a question I am often asked: What has been the most valuable learning experience in your work as an interim minister and why? Here's my response. Mission and transition are dynamically related. When a faith community is intentional about discerning the mission entrusted to it and committed to engagement in that mission, it is also willing to be intentional about the transitions that are necessary. The dots have to be connected. While considering leaving the parish I had served as rector for almost a decade, I was intrigued by the work being accomplished by colleagues who were intentional interim rectors. In conversations with them, I was encouraged to explore service to the wider Church through transitional ministry instead of as a settled rector in one parish. That discernment led to training in intentional interim ministry, during which I suddenly realized that all churches are in some sort of transition most of the time, although often unconscious of it. Transition training should be core seminary curriculum. Transitions between settled rectors provide a unique opportunity to explore transition – remembering where we’ve been, clarifying where we are, discerning where God is calling us, making changes that are needed, connecting with the wider church, and embracing a new era of mission with a new spiritual leader. But that is not the end of transition! The Church doesn’t have a mission. The mission has a Church. Everything we do as followers of Christ in community is related to and in the service of that mission. And God’s mission is constantly in transition. It became clear to me that when a church continues to function as if nothing has changed, the mission suffers. It also became clear to me that the mission suffers when changes are needed but are avoided or resisted. So, intentional transition work in the Church, whether between rectors or at any time, must involve discernment about mission, participation in what God is doing for the sake of the world at our doorstep. Transition work matters only in relation to mission. This insight guides my leadership so that after our interim time together, consciousness of the dynamic relationship between ongoing mission and ongoing transition will continue. Churches that are engaged in mission are healthier, happier, and more attractive to those who are seeking what Christ offers through them. In such places, transition evokes transformation. I would like to leave a legacy of healthy, mission-focused, transformative congregations in my service to the wider Church. 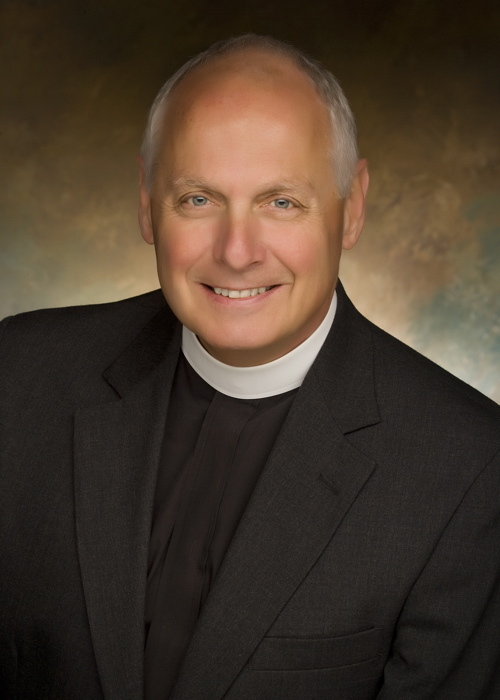 The Rector of St. John’s Episcopal Church in Jackson Hole, Wyoming also has responsibility for The Chapel of the Transfiguration in Grand Teton National Park and The Chapel of St. Hubert the Hunter in Bondurant, Wyoming. Following an outdoor service on the last Sunday in June each year, the folks at St. Hubert's host a barbeque, to which people come for miles around. Gay and I were privileged to participate in one of those during my interim appointment in Wyoming. In the service of worship, at which I presided and preached, and in the crowd at the barbeque, I was conscious that I was there on a mission from God. I didn’t just happen by or show up. I was sent there on a mission and equipped by God with “good news” of the kingdom of heaven for all sorts and conditions of people. But when I started out that morning I did not realize that, in the midst of that mission to others, I would experience God’s reign myself. At the barbeque, seated at one end of our table were two young men from Israel. They were driving along, saw the sign, and turned in to enjoy some genuine western barbecue beside an Episcopal Church. They asked about lodging and things to see on their way to Yellowstone. We took delight in suggesting things we’d seen and done during our brief time in the area. Having been welcomed in their country when we traveled there, we were glad to have an opportunity to extend hospitality to them as they traveled through ours. When they started to leave, we wished each other “Shalom.” In the exchange of that ancient word of peace, our eyes met. We understood one another in some new way. Strangers became friends as our kinship with our Creator was acknowledged. I experienced God’s reign on earth, transcending time and space and even barbecue. At the other end of the table was a couple from a neighboring state. They have been riding their motorcycles to Bondurant for years to participate in this annual event. After a short conversation, one of them raised the subject of the Church’s view of homosexuality. Gay gently expressed the inclusive view one finds in The Episcopal Church and what that means for so many people whom we cherish. Silence. Then, they opened up and talked about what it means for them, their daughter and her partner. Our eyes met. We understood one another in some new way. Strangers became friends as our kinship with our Creator was acknowledged. I experienced God’s reign on earth, transcending time and space and even barbecue. On my way to the car, a member of the band that played for both the service of worship and the barbecue approached me. She thanked me for the service and told me that although she was Baptized at an early age, this was the first time she’d ever received Holy Communion. She said that her decision to come forward on this occasion was made when she heard me say, “Whoever you are, wherever you’re from, and wherever you may be on your spiritual journey, you are welcome here.” In that moment in time, in that particular location, she knew that she is included in God’s love and hospitality. Our eyes met. We understood one another in some new way. Strangers became friends as our kinship with our Creator was acknowledged. I experienced God’s reign on earth, transcending time and space and even barbecue. Our recent readings from Mark’s Gospel concern Jesus during his Galilean ministry, crossing back and forth between Jewish and Gentile territories. God’s reign became evident in the encounters between Jesus and the people to whom he was sent. You and I are called to recognize the signs of God’s reign when we see them in our encounters with others. Even more, we are privileged to be heralds of God’s reign wherever we may be to help others recognize God’s reign for themselves. I’ll see you in Church! P.S. The theme of our fall stewardship season is drawn from this prayer. “Open our eyes to behold your gracious hand in all your works.” Consecration Sunday, with one great morning worship service and a complimentary brunch celebrating our life together is October 14. Please make plans to join us! The Race Goes Not Always to The Swift. . .But to Those Who Keep On Running. Encouragement! Someone put those words there to encourage people who were running the race. Don’t give up! Keep on keeping on! There is value in the running of the race. There is victory in completing it. When Jesus sent the twelve apostles out on their mission, he let them know that not everyone would welcome them. “If any place will not welcome you and they refuse to hear you, as you leave, shake off the dust that is on your feet as a testimony against them” (Mark 6:11). Encouragement! Jesus gave them those words to encourage them to continue in their mission even when they were not welcomed. A friend of mine once called this “the sacrament of failure.” Jesus gave his apostles permission to fail and an outward sign that would help them leave that failure behind and continue in their mission. The writer of the Letter to the Hebrews also knew there is value in running the race to its completion. “Therefore, since we are surrounded by so great a cloud of witnesses, let us also lay aside every weight and the sin that clings so closely, and let us run with perseverance the race that is set before us, looking to Jesus the pioneer and perfecter of our faith, who for the sake of the joy that was set before him endured the cross, disregarding its shame, and has taken his seat at the right hand of the throne of God” (Hebrews 12:1-2). Encouragement! Both Jesus and the writer of the Letter to the Hebrews intended their words to encourage Christ’s followers to keep on keeping on, because they knew there would be plenty of times when being Christian would be difficult. The race that is set before us. A missionary people need encouragement to persevere in the work of Christ. He’s in it with us. Every age and mission outpost has its challenges. If we will continue to faithfully put one foot in front of the other, Jesus will provide what is needed to endure and to transcend the challenges. When we fail trying, he will keep us from settling into that failure and help us move on toward completion. As my wife, Gay, often reminds me, “Life is not about falling down. . .it’s about getting up and trying again.” Let us always encourage one another to continue in the life and work of Christ. Your thoughtful comments will make a visit to e-piphanies a richer experience for everyone. By clicking on the "Comments" link beneath each post, you can read the remarks others have written or add your own. If you leave a question, I will respond in the journal. In order to maintain the integrity of this blog, all comments are reviewed before being published on line. All content © 2007 to 2012, Ron Pogue. All rights reserved.